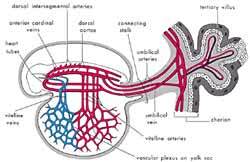 The third meaning of the word alaqah is “blood clot.” We find that the external appearance of the embryo and its sacs during the alaqah stage is similar to that of a blood clot. 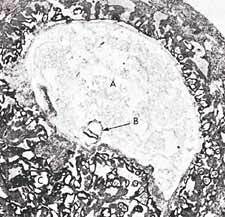 This is due to the presence of relatively large amounts of blood present in the embryo during this stage(see figure 4). 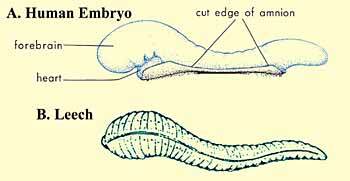 Also during this stage, the blood in the embryo does not circulate until the end of the third week. Thus, the embryo at this stage is like a clot of blood. The next stage mentioned in the verse is the mudghahstage. 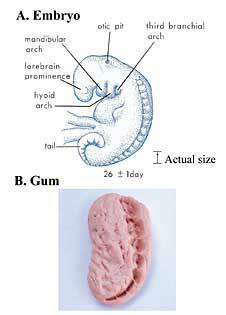 The Arabic word mudghah means “chewed substance.” If one were to take a piece of gum and chew it in his or her mouth and then compare it with an embryo at the mudghah stage, we would conclude that the embryo at the mudghah stage acquires the appearance of a chewed substance. 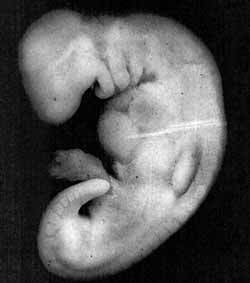 This is because of the somites at the back of the embryo that “somewhat resemble teethmarks in a chewed substance.” (see figures 5 and 6). How could Muhammad (pbuh) have possibly known all this 1400 years ago, when scientists have only recently discovered this using advanced equipment and powerful microscopes which did not exist at that time? Hamm and Leeuwenhoek were the first scientists to observe human sperm cells (spermatozoa) using an improved microscope in 1677 (more than 1000 years after Muhammad (pbuh)). They mistakenly thought that the sperm cell contained a miniature preformed human being that grew when it was deposited in the female genital tract. During one conference, Professor Moore stated: “....Because the staging of human embryos is complex, owing to the continuous process of change during development, it is proposed that a new system of classification could be developed using the terms mentioned in the Quran and Sunnah (what Muhammad (pbuh) said, did, or approved of). 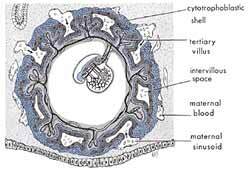 The proposed system is simple, comprehensive, and conforms with present embryological knowledge. The intensive studies of the Quran andhadeeth (reliably transmitted reports by the Prophet Muhammad’s (pbuh) companions of what he said, did, or approved of) in the last four years have revealed a system for classifying human embryos that is amazing since it was recorded in the seventh century A.D. Although Aristotle, the founder of the science of embryology, realized that chick embryos developed in stages from his studies of hen’s eggs in the fourth century B.C., he did not give any details about these stages. As far as it is known from the history of embryology, little was known about the staging and classification of human embryos until the twentieth century. For this reason, the descriptions of the human embryo in the Quran cannot be based on scientific knowledge in the seventh century. The only reasonable conclusion is: these descriptions were revealed to Muhammad from God. He could not have known such details because he was an illiterate man with absolutely no scientific training.